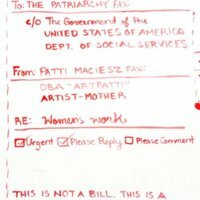 Patti Maciesz is a Polish-American artist and curator based in Oakland, California. Her paintings explore place, narrative and identity and blend digital and analog techniques. Her work has been exhibited in Paris, Warsaw, Vermont, New York and Oakland. She graduated with a degree in Visual Arts from Bennington College in 2007 and later managed the Aldrich Editions program at the Aldrich Contemporary Art Museum. She has since curated multiple international exhibitions including the inaugural exhibition at the Centre Du Mode et du Dessin for Chic Art Fair in Paris, Nowa Soda, an artist-in-residency program in Krakow and most recently Country Singer, a digital art show at Heron Arts in San Francisco featuring artist Dmitri Cherniak. Her recent work takes on the secrecy surrounding postpartum life by presenting the often brutal and sometimes comic realities of early parenthood. In a series of watercolor paintings the artist shares relatable and intimate portraits of her changing body, as well as documentation of the endless minutiae and unrewarded sacrifice of caring for a new child. Part figurative abstraction, part charting and time-sheet, Maciesz resists the invisibility that envelopes mothers with her work. 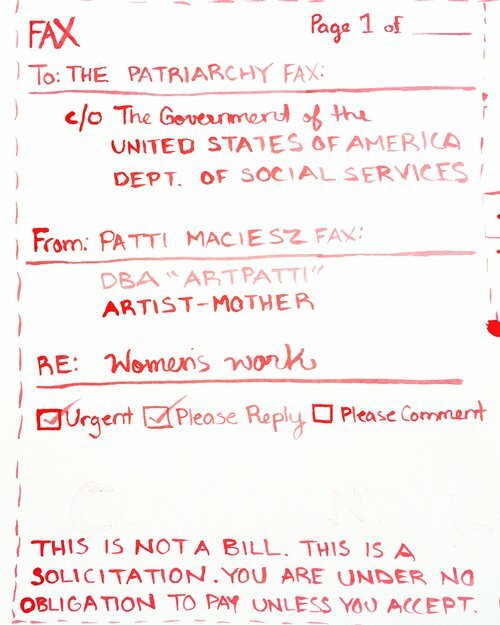 ArtPatti, “Patti Maciesz,” Artist Parent Index , accessed April 22, 2019, http://www.artistparentindex.com/items/show/288.